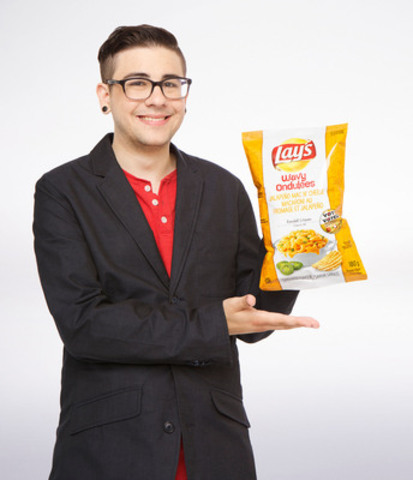 MISSISSAUGA, ON, Oct. 21, 2014 /CNW/ - Potato chip lovers across Canada have something to be excited about today as the winner of the Lay's Canada 2014 Do Us a Flavour contest is revealed. 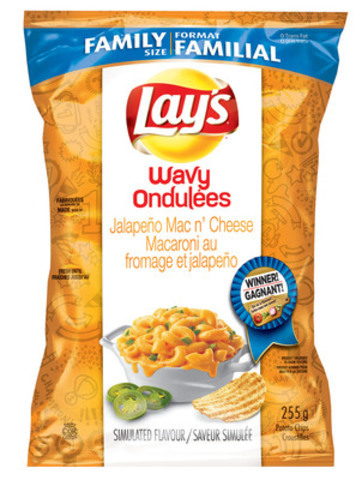 Canadians bought, tried and voted for what they thought would be yummy as a chip and have chosen Jalapeño Mac N' Cheese on Lay's Wavy as the next great Lay's potato chip flavour. Randall Litman from Calgary, Alberta was inspired to create Jalapeño Mac N' Cheese from the variety of foods on the same plate at summer barbeques. His favourite combination is when Lay's potato chips end up next to macaroni salad, adding some jalapeño to give it a nice kick. The winning flavour will be re-released across Canada in late November. In addition to chip aisle fame, Randall will receive $50,000 plus one per cent of his flavour's future sales. "It's surreal being crowned this year's winner by Canadians. A big thank you to everyone who voted for Jalapeño Mac N' Cheese," says Randall. "It's incredible to think that my submission, which started from a conversation I had with my wife at a barbeque, will now join the Lay's flavour lineup." Earlier this year, the Lay's Do Us a Flavour contest challenged Canadians to submit their ideas for the next great potato chip flavour. In less than two months, the contest received over a million submissions from fans across the country. In August, the Lay's brand revealed the four finalist flavours and Canadians were invited to decide the winning flavour by trying all four and voting for the yummiest from August 12 to October 15. Potato chip aficionados coast to coast rallied behind their favourite flavours conducting Do Us a Flavour reviews on blogs and Facebook while voting on Twitter, Instagram, via text and on the Lays.ca/Flavour website. Canadians certainly showed their passion for the Lay's brand and flavour innovation. "We were overwhelmed by the level of passion that Canadians have demonstrated for the Lay's Do Us a Flavour contest. Watching fans across the country participate in the flavour debate has been incredible," says Susan Irving, Director of Marketing at PepsiCo Foods Canada. "Randall, congratulations on being named our 2014 winner with your yummy Lay's Jalapeño Mac N' Cheese flavour." When asked what he plans on doing with his winnings, Randall replied, "I'm lucky enough to have married my best friend – her love and support already make my life rich. Winning $50,000 will allow us to bridge our dreams of a home and family with reality, it's unbelievable!" The Lay's Do Us a Flavour contest has been held in numerous countries around the world and has generated an incredible response with millions of flavour submissions. From the UK to India, Australia to South Africa and the US, the Do Us a Flavour campaign has resulted in a wide spectrum of chip flavour ideas created by consumers including Ceasar Salad (Australia), Chili & Chocolate (UK), Mastana Mango (India), Walkie Talkie Chicken (South Africa) and Cheesy Garlic Bread (US). Lay's potato chips are Canada's favourite potato chip brand, leading the market share in all Canadian regions. Lay's is one of PepsiCo Canada's flagship brands. For more information, please visit Lays.ca. PepsiCo's businesses in Canada are organized into two business units. PepsiCo Foods Canada includes Frito Lay Canada and the Quaker Foods and Snacks business. PepsiCo Beverages Canada includes Pepsi-Cola Canada, Gatorade and Tropicana. For more information, please visit Pepsico.ca. At the heart of PepsiCo is Performance with Purpose – our goal to deliver top-tier financial performance while creating sustainable growth in shareholder value. In practice, Performance with Purpose means providing a wide range of foods and beverages from treats to healthy eats; finding innovative ways to minimize our impact on the environment and reduce our operating costs; providing a safe and inclusive workplace for our employees globally; and respecting, supporting and investing in the local communities where we operate. For more information, visit Pepsico.com.